It was so delighted to visit the Pred Nai mangrove community near the Cambodia border as I felt like I had returned home. I first visited Pred Nai while working with RECOFTC (the Regional Community Forest Training Center for Asia and Pacific, now called the Center for People and Forests) before I joined MAP 12 years ago and have since visited Pred Nai many times. As this is the first place I learned about mangrove I am full of good memories when visiting Pred Nai. Between 23-25 July, 2018 my colleague Em (Mr. Udomsak Pariwatpan) from the MAP Thailand team and I, together with eight CBEMR network representatives from Ranong, Phang Nga, Krabi and Trang Provinces in Thailand celebrated Mangrove Action Day or the International Day for the Conservation of the Mangrove Ecosystem on the 26th of July by learning and sharing experiences on community-based mangrove conservation and restoration at Pred Nai Community, Trat Province on the eastern coast of Thailand. Our CBEMR members gained valuable knowledge from the Pred Nai Community who have over 30 years of experience in participatory mangrove management. The highlight of the trip was visiting the 7.2 hectares of restoration site which the villagers started to restore 9 years ago in abandoned shrimp ponds back to natural forest again. 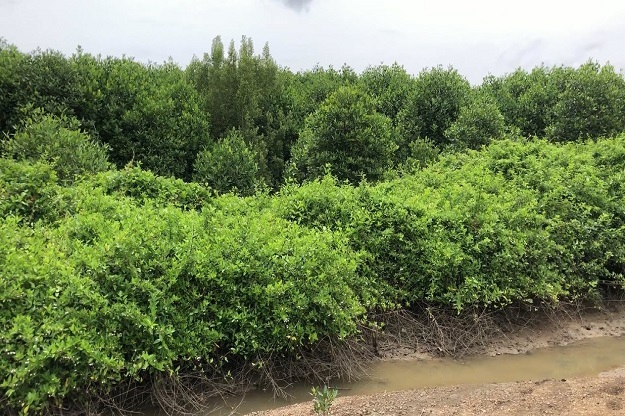 This mangrove restoration project was a concrete example of a conservation group allocating their own community conservation funds to buy the abandoned shrimp ponds and return them back mangroves. Through their experience, Pred Nai members have become well-equipped in community-based practices and have developed a strong community organization working as a learning center for the region and even at the national and international levels as well. One outstanding concern made by Uncle Yai (Mr. Amnuay Chumanee), one of the conservation leaders at Pred Nai, concerned how to transfer their conservation awareness to the Pred Nai youths so what they’ve achieved is not lost. This is clearly an important issue looking forward for the sustainability of the conservation group and the work they carry-out. Participants from the Andaman CBEMR network were asked to reflect on the key lessons learnt which they will be taking home while at the Kung Krabaen Bay Royal Development Study Center, an excellent mangrove restoration area with boardwalk in Chantaburi Province before returning home. Most of the members observed and emphasized the importance of the strong community organization at Pred Nai, which is not only a conservation group but also includes collaborating with all the other groups in the community. The community mangrove forest regulation needs to be practical but not conflict with official law and strictly enforced by the local conservation committee. Another learning point shared at the meeting was that the learning center management needs to collect high-quality accurate information and be able to be clearly presented to visitors groups with the participation of local people in all aspects of the process. As learning center is one of our CBEMR members projects which members plan to develop in their own community so that local people can validate the information and proudly present from their own personal experience. Besides all the lessons the group learned from this study trip, I think the trip was a great success because the relationship between MAP and the participants have become stronger through the time we spent together. I am very confident that we will continue working together as a small network and that we will grow strong as we follow the motto “small but strong”. 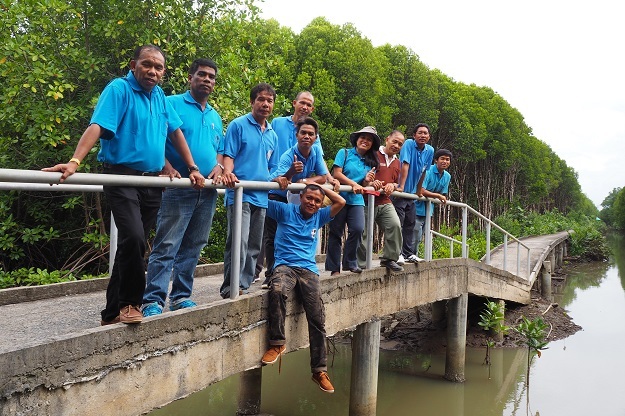 MAP staff and Andaman CBEMR network members at Pred Nai mangrove boardwalk, Trat Province, eastern Thailand. Photo 2011 of the Pred Nai mangrove restoration site. The community planted some Rhizophora apiculata propagules and then allowed natural regeneration to occur. July 2018 photo: Look at the difference!! 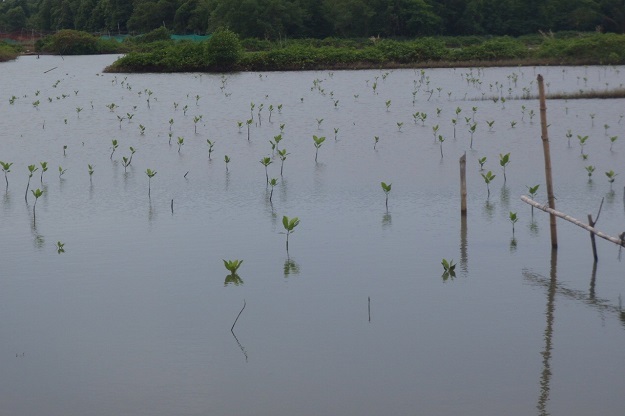 In just 7 years the area is now a thriving healthy mangrove forest.